If you are even a little like me then you have lots of pens. 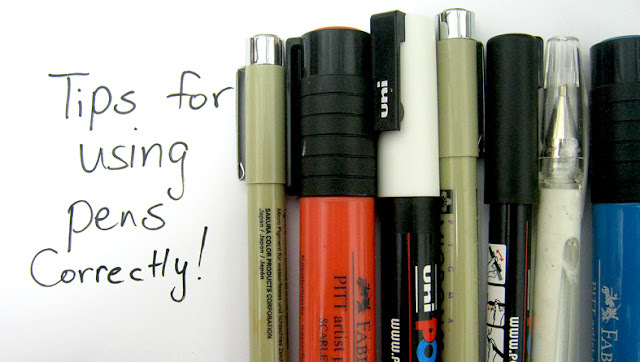 On friday I shared with you what are my favorite pens. Today I want to share with you how to use them and store them so they'll last as long as they are supposed to. 1. Make sure that your surface is completely dry if you're using acrylics or acrylic mediums before you start writing or doodling. If the surface is wet the tip will be destroyed. 2. If using watercolors or watercolor crayons, go over the surface (when you are finished and everything is dry) with a thin coat of gloss medium to seal the watercolors and give it a surface that has some tooth. Keep the application thin and you may have to work in small sections so that the watercolors don't mush around. This way the pen will write more easily and smoothly. 3. Keep an even hand. The ink should flow from the pens with a steady flow. Don't apply too much pressure. 4. Keep a piece of scrap paper that is uncoated nearby so you can test your pens on it. 5. Test your pens on similar color/kind of paper before you use it on your artwork that way you can see if the color is what you want and if it does what you want. 6. If you're using a Gel pen write very slowly to achieve an embossed raised writing. 7. If you are using a paint marker, shake (always with the cap on) the pen and pump the tip up and down on scrap paper to get the ink flowing. 1. Keep your pens capped when not in use. They dry up very quickly if you don't recap them. I hope you found this informative :) Questions? You can leave a comment here in the post. What's your favorite, must have pen? כדי להבין נכון, העטים, צבעים ,טושים ועוד רצוי מאוד שהם יונחו בשכיבה? לא על הראש ולא על הפקק.... נכון? עינת אני מצפה לתשובתך. תודה.